New book, 64 pages. ELI193. 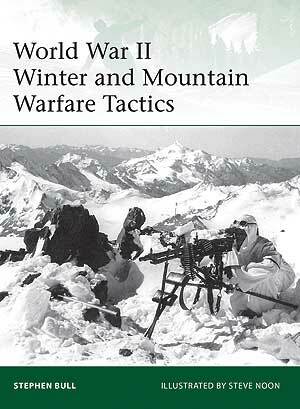 The twentieth century saw an unprecedented emphasis on fighting in all terrains, seasons and weather conditions. Such conditions made even basic survival difficult as subzero temperatures caused weapons to jam, engines to seize up and soldiers to suffer frostbite, snow blindness and hypothermia. The conditions often favoured small groups of mobile, lightly armed soldiers, rather than the armoured forces or air power that dominated other combat environments. Some European armies developed small numbers of specialist alpine troops before and during World War I, but these proved to be insufficient as nearly all the major combatants of World War II found themselves fighting for extended periods in extremely hostile cold-weather and/or alpine environments. Drawing upon manuals, memoirs and unit histories and illustrated with period tactical diagrams and specially commissioned full-colour artwork, this study sheds new light on the winter-warfare tactics and techniques of the US, British, German, Soviet and Finnish armies of World War II. Contents: Introduction: strategic and tactical constraints of terrain and climate on military operations; Pre-war background work: British Polar Institute - Indian Army - European Alpine troops - transport, sleds and skis; Russo-Finnish Winter War of 1939-40: materials and experience - 'motti' tactics; Narvik 1940 - Norwegian experience - establishment of British Commando Schools; The Russian Front, 1941: Russian tactics, German inadequacies and improvisation; German responses 1942-44: winter warfare and ski-troop manuals; US responses: manuals 1941-44 - tactical training - clothing and equipment; Italy, 1943-45: mountain warfare - mule transport; The West, 1944-45: British in the Netherlands - Battle of the Bulge - snow camouflage. This item was added to our catalog on Monday 30 September, 2013.